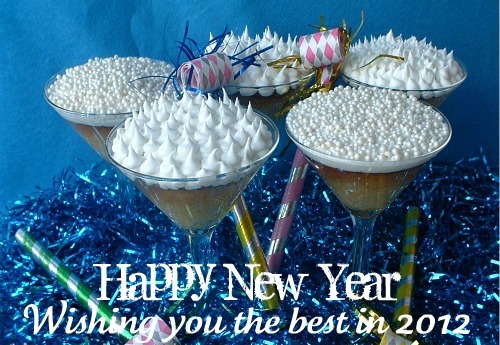 As promised, I have another New Year’s Eve Cupcake for you! But never fear…they are super easy. Do you remember the Candy Cane Cupcake Shooters from Christmas? 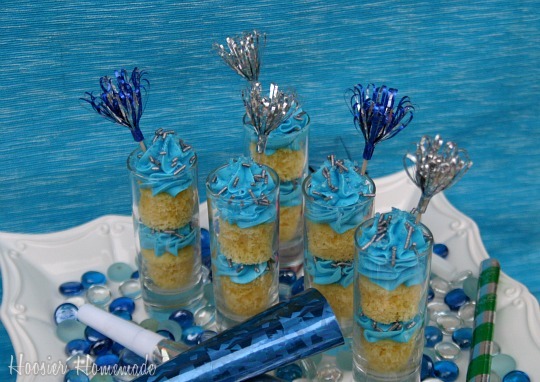 These New Year’s Eve Cupcake Shooters are just like them, I just changed up the colors and flavors. Bake the cupcakes, no liners needed, let cool completely. Cut with small round cookie cutter. 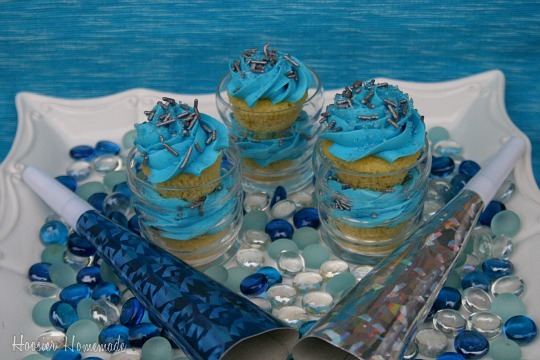 Color icing with Sky Blue coloring, fit a decorator bag with a #1M Tip, and fill with icing. Layer cupcake, icing, and sprinkles. Repeat layers and add a frilly pick if you like. The color options are endless. I think they would even make a great Baby or Bridal Shower treat, be sure to serve with a spoon though. And in case you don’t have the shot glasses, I thought I’d share how they look in a small votive glass. Just about any little glass will do, you could even use a clear plastic glass if you are feeding a crowd. I used the whole mini cupcake in these, you will need to adjust the size of your cupcake depending on the size of the glass.